Authentic full-size replica of the legendary Zeo Zeonizer! The morpher from the Power Rangers Zeo TV series. Perfect for display or cosplay! This authentic Power Rangers Legacy Zeo Zeonizer Prop Replica is a full-size rendering of the legendary morpher from the Power Rangers Zeo TV series. 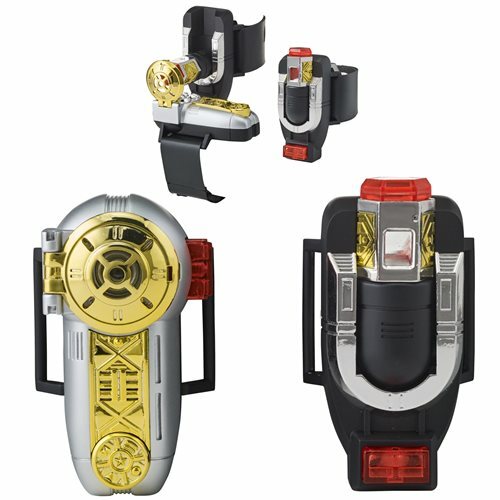 That Zeo Zeonizer utilized the Zeo sub-crystals and was the first wrist-worn morpher in the show. Featuring show-accurate lights and sounds, plus premium die-cast parts, this Zeonizer is perfect for display or cosplay! It's made of quality plastics, die-cast metal, and electronic components and requires 3x "LR44" batteries, which are included. Ages 15 and up.